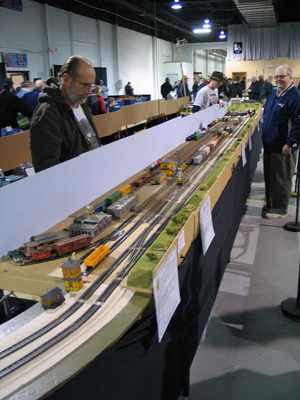 When set up for a show, our layout is assembled from multiple modules. Not all modules are necessarily used at all shows. Sometimes, this is due to space restrictions. Other times, individual modules may be out for repairs or improvements. Click on the links at left to see more information about each individual module. We try to give as much flexibility to the individual modelers who build the modules, so that their creativity and craftsmanship can be expressed, while still being able to connect their modules with all the others. 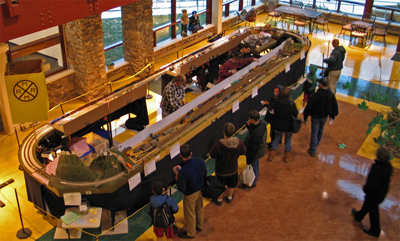 Some of our modules, assembled into a small layout at a public show. The main yard is made up of several modules. These special modules must always go together in the same order, but most modules can go anywhere in the display. The shape of the layout is flexible - it does not need to be square. An "L" shape allowed it to fit in the space provided during this show. 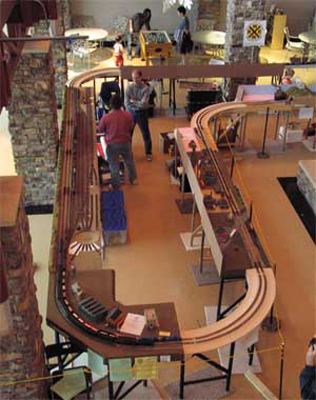 Entire site ©2008-2016 Royersford Modular Model Railroaders.